For those expecting the light, delicate and elusive nature that is commonly associated with white and yellow teas will be in for a big surprise with Wei Shan Mao Jian. 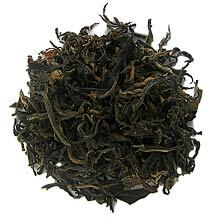 For this tea is remarkably smoky in both taste and fragrance. However, this is not to say that it is a bad tea in any way. On the contrary, people who appreciate its unique characteristic raved highly about this tea. Among those who are known to adore this tea were Chairman Mao and Chairman Liu (Shaoqi), the latter of which was known to serve this tea to all his guests from all over the world. Hua Guo Feng (a famous Chinese poet) once stated that "Wei Shan Mao Feng has a very special style and is truly unique from all other teas". We couldn't agree more. The tea leaves are picked from very limited wild grown tea trees, making this a very rare and unique yellow tea.